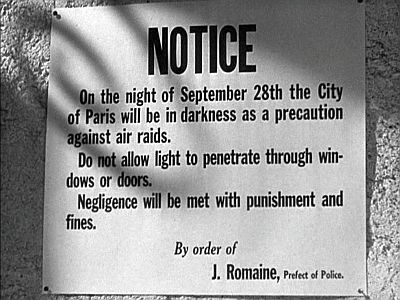 On September 28, 1938, the great powers of Europe are poised on the brink of war, and Paris, the City of Light, is plunged into darkness as a total blackout is ordered out of fears of an air attack. Charlie Chan, is attending the twentieth anniversary gathering of members of the Intelligence Service, who have come together in Paris to mark the occasion. "Most ironic that reunion to celebrate end of one war finds us waiting zero hour which may start a new one," states a somber Mr. Chan. However, the detective is drawn into a murder case when Petroff, a wealthy exporter, is killed that night. 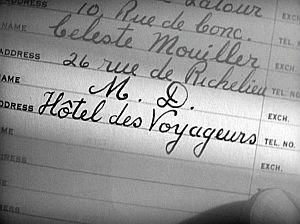 While Chan's investigation progresses, as he "assists" the inept Marcel Spivak, he narrows the list of suspects to Tony Madero, a man whom Petroff had framed for forgery because he had objected to Petroff's unwelcome attentions to his wife, Marie Dubon; Alex, "Gentleman" Max, and Lola, three burglars who had broken into Petroff's house that night; Belescu, Petroff's business partner; Louis Santelle, a locksmith who was in the business of printing false passports; and Antoine, Petroff's French butler. 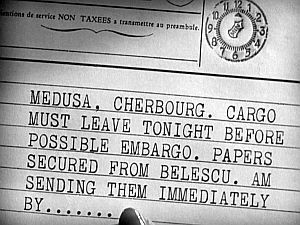 Chan discovers that Petroff had died while dictating a telegram about obtaining clearance papers for a special cargo. The detective realizes that Petroff was a foreign agent who was dealing in munitions with a potential enemy of France. Chan then traces Belescu to Charlotte Ronnell, the head of a spy ring that was shipping munitions to the enemy. A high-speed chase leads to an airport where, while trying to make her escape, Charlotte dies in a fiery crash during takeoff. Back at police headquarters, Antoine admits that it was he who killed Petroff during a struggle after Antoine had found that the latter was shipping weapons to the enemy, an enemy against whom his own son might soon be fighting. To this admission Chan states, "In Humble opinion, murder is harsh word for act committed in defense of country." 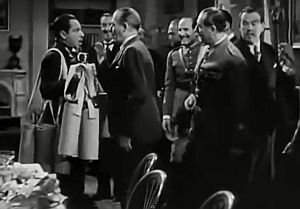 After Prefect of Police Romaine declares that Antoine will receive the Croix de Guerre for his service to his country, Romaine receives word of the Munich peace conference and jubilantly announces that there will be no war. Prophetically, Charlie Chan states, "Wise man has said, 'Beware of spider who invite fly into parlor.'" 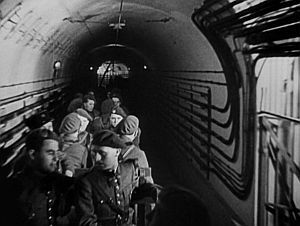 NOTES: Charlie Chan in City in Darkness begins with newsreel-like footage featuring actual European leaders of the moment, including Adolph Hitler, Benito Mussolini, Edward Benes (then president of Czechoslovakia), and Neville Chamberlain (then prime Minister of Great Britain, who became famous for his "Peace for Our Time" statement based on the dubious outcome of the Munich Conference which figures at the end of the film via Charlie Chan’s ominous warning). Birds never divide worm until safe in nest. In every city there are roosts where birds of feather congregate. Patience big sister to wisdom. Confucius has said, "A wise man question himself, a fool others." To describe bitter medicine will not improve its flavor. Wise man has said, "Beware of spider who invite fly into parlor." Charlie Chan gets tangled in a murder mystery in Paris during the Munich crisis, unravels a spy ring, blocks shipment of contraband, rounds up numerous suspects, and finally solves the crime with intuitive deductions. 'City in Darkness' is decidedly weak in story factors, and slow in proceeding through to the eventual finish. It's one of the weakest in the 'Chan' series. A moderate supporting programmer. Story is threadbare of essential drama generally concocted for the Chan pictures, and struggles through without sufficient interest for a murder mystery. Chan, in trying to book passage out of France, is catapulted into the middle of a murder mystery. Proceeding to untangle the mess, hampered by wild deductor Harold Huber, roundup finds smashing of a spy ring in addition to other elements of the government. Direction is inadequate, further hampered by poor story material. Attempts to provide Huber with comedy as a jittery police novice are ineffectual. The audience is never presented with sufficient interest in the murder or culprit, and the mystery just unwinds without much attention. THE TIME SHOWN ON LONDON'S "BIG BEN" CLOCK DURING THE PROLOGUE: 6 p.m. THE TIME AS NOTED BY CAPTAIN HOLTZ TO CHARLOTTE RONNELL AS THE MAIL PLANE FROM LONDON IS HEARD OVERHEAD: "A quarter of six (p.m.)"
THE STATED TIME THAT THE NEXT PASSENGER SHIP WAS TO SAIL THE NEXT DAY: 11 a.m. THE TIME AS ANTOINE LEFT PETROFF'S HOUSE WITH SON PHILIPPE: 9:45 p.m. 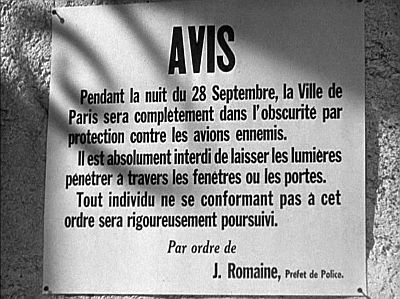 ACCORDING TO MARCEL SPEVART, THE STREET THAT PETROFF LIVES ON: "Rue d'Avignon"
THE ACTUAL DEPARTURE TIME OF PHILIPPE'S TROOP TRAIN: 11:31 p.m. 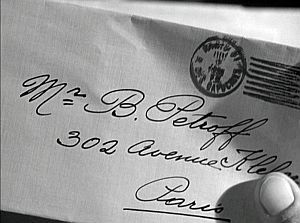 THE DISTANCE AT WHICH THE FATAL SHOT WAS FIRED: "Three paces"
THE LENGTH OF TIME THAT PETROFF HAD BEEN DEAD WHEN THE POLICE ARRIVED AT THE CRIME SCENE: "Aproximately one hour"
THE ADDRESS OF LOUIS SANTELLE AS PARTIALLY SHOWN ON HIS CARD: "321 Rue du ---"
THE CONTENTS OF THE FOLDER BROUGHT TO POLICE HEADQUARTERS CONTAINING STOLEN ITEMS FROM PETROFF'S SAFE: "Government bonds, jewelry, and 6,000 francs." THE TIME, ACCORDING TO BELESCU, AS HE ARRIVED AT PETROFF'S HOUSE: 11:30 p.m. THE TIME AS THE MESSAGE WAS DICTATED: 12:06 a.m.
angina pectoris - A heart condition marked by paroxysms of chest pain due to reduced oxygen to the heart. Landlady: My old man died from his angina pectoris, and only 46 years old." Charlie Chan: "Cherchez la femme?" Marcel Spivak: "I never saw so many Cinderellas." Charlie Chan: "Note, bottle of cognac recently disposed of." Antoine: "Did you pack cootie powder in your kit?" Marcel Spevart: "We will get the Croix de Guerre - with palms!" Belescu: "...I gave them the slip." Marcel Spevart: "His mother was guillotined." Hitler (Adolf Hitler, 1889-1945) Austrian-born founder of the German Nazi Party and chancellor of the Third Reich (1933-1945). His fascist philosophy attracted widespread support, and after 1934 he ruled as an absolute dictator. 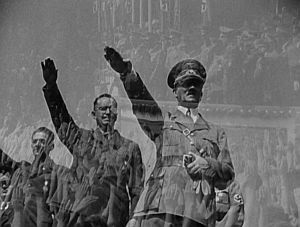 Hitler's pursuit of aggressive nationalist policies resulted in the invasion of Poland (1939) and the subsequent outbreak of World War II. His regime was infamous for the extermination of millions of people, especially European Jews. He committed suicide when the collapse of the Third Reich was imminent. Narrator: "Hitler has pledged Germany to protect the Sudetens." Prefect of Police Romaine: "Comrades of the Intelligence Service..."
Belescu: "Take me over to the Left Bank." Charlie Chan: "Empty shell, ejected from Luger automatic pistol." Narrator: "Soldiers pour into the famous Maginot Line." Mussolini (Benito Mussolini, 1883-1945) Led Italy from 1922 to 1943. He created a fascist state through the use of state terror and propaganda. 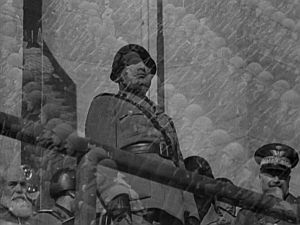 His entry into World War II on the side of Nazi Germany made Italy a target for Allied attacks and ultimately led to his downfall and death. Narrator: "Rome parades her troops before Mussolini." Charlie Chan: "...nitric acid used in making printing plates." Belescu: "You're not going to put me on the spot for murder!" President Benes (Eduard Benes, 1884-1948) Czechoslovakian politician who was foreign minister (1918-1935) and president (1935-1938) until the German occupation forced him to flee the country. 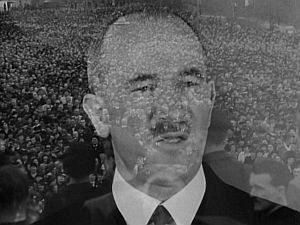 On his return he was again elected president (1946) but resigned after refusing to sign a Communist constitution (1948). Narrator: "President Benes urges the Czechs to defy the Nazi demands." 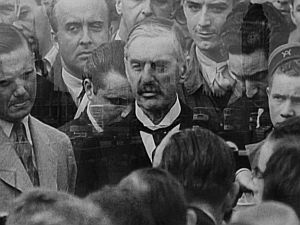 Prime Minister Chamberlain (Neville Chamberlain, 1869-1940) British politician and prime minister (1937-1940) who advocated a policy of appeasement toward the fascist regimes of Europe. He was forced to declare war on Germany after its invasion of Poland in 1939. Narrator: "...Prime Minister Chamberlain rushes by plane to Hitler for a last-minute plea to avert war." Charlie Chan: "Quite evident sugar daddy attract many butterflies."